Airport Collaborative Decision Making (A-CDM) is a process by which communicating and exchanging information between stakeholders (traffic controllers, airport management, airlines, ground staff etc.) is made easier through an automatic computerized process. The objective is to improve Air Traffic Flow and Capacity Management (ATFCM) at airports by reducing delays, improving predictability of events and optimising the utilisation of resources. 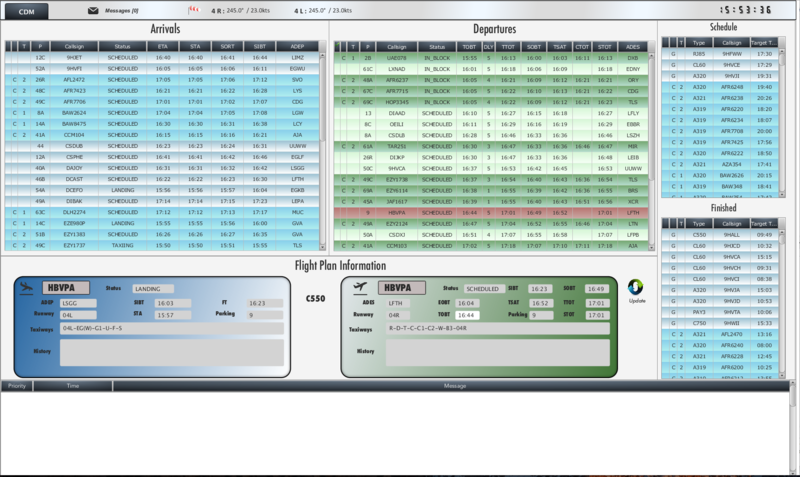 An interactive management tool enabling the sharing of data and decisions with ease, and specific HMIs for all stakeholders – Airlines, Civil Aviation Authorities and Airports. SkyKeeper® A-CDM is a tool with real benefits, an example from an airline’s point of view – suggestions of flight priorities in order to reduce global delays on their fleet and the costs resulting from delays. Our solution is based on a truly Airport CDM (Collaborative Decision Making) approach and meets the needs of airports, air traffic controllers and airlines. SkyKeeper® A-CDM is as close to operational needs as possible with RECAT rules and Time Based Separation (TBS) principles embedded in the system, allowing the implementation of new principles without any deleterious consequences on controller workload.